Established as a park in 1833, Union Square has gone through periods of neglect and redevelopment but beginning in the late 1980s notable buildings near the park, and the park itself, were designated as landmarks. In 1807, New York City Common Council appointed three commissioners to lay the grid system in Manhattan above Houston Street. When they discovered a potter’s field at the intersection of Bloomingdale Road and Bowery Road, City commissioners decided to incorporate the area within the grid and name it Union Place.2 It was officially deemed a public park in 1833, and redesigned in 1839 to resemble the elegant park squares seen in London at the time.3 A large fountain was placed in the center, and an iron fence was erected around the perimeter of the park. The area surrounding Union Square Park also attracted commercial businesses, theaters, music halls, and publishing enterprises. During the post-Civil War period piano shops, including the Decker Brothers, Schere and Co., and Steinway and Sons Co., began to open around the square. In 1866, Steinway Hall opened on 71-73 East 14th Street.5 This building functioned as the offices for Steinway employees, a piano store, and a music hall. The music hall, one of the largest halls in New York City prior to the construction of Carnegie Hall, was also home to the New York Philharmonic Symphony.6 Another important landmark was Lüchow’s German restaurant on 14th Street, which attracted German residents and employees of the local music shops. 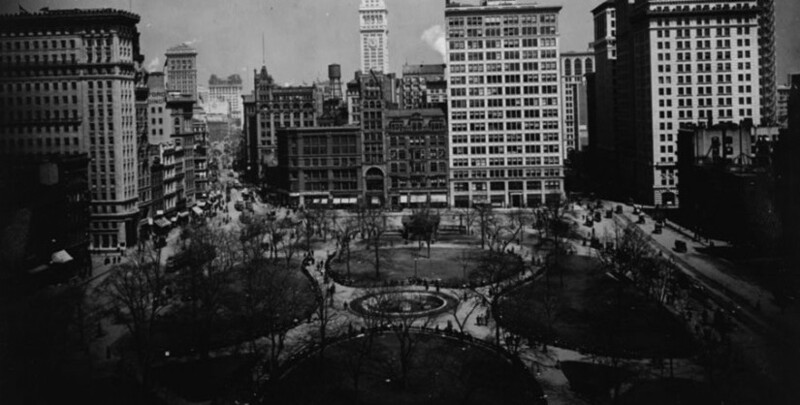 In 1928-29, Union Square Park was demolished to make way for subway construction.11 Following this period and into the mid-20th century, Union Square suffered from dereliction due to the economic decline of the Great Depression. Many commercial businesses moved uptown because of cheaper real estate. Despite these calamities, Union Square continued to be a hotbed for political demonstrations and labor union activism. In an effort to revitalize the Union Square area, the City began implementing plans to draw more businesses to the center. The first Earth Day festival was celebrated at Union Square Park on April 22, 1970.12 In 1976, Union Square Green Market was created to provide local farmers with a means to sell fresh produce and attract businesses back to the Union Square area.13 In addition, the area was rezoned in order to permit the construction of larger buildings for mixed uses.14 New York University’s campus expanded, and high-rise condominiums sprang up. In 1987, the Zeckendorf Towers were constructed, altering the overall neighborhood surrounding the park. Under Mayor Koch’s administration, the park underwent renovations, which included a new plaza on the south end.15 Although these developments cleaned up the area and brought financial incentives, a number of historic structures were demolished in order to facilitate this transformation, including Lüchow’s German restaurant and the original Steinway Hall. Union Square was declared an official National Historic Landmark in 1997.16 There are six plaques commemorating the labor union activism that took place in the park. In addition there are several statues in honor of political world figures: an equestrian statue of George Washington (1856), Marquis de Lafayette (1876), Abraham Lincoln (1870), and Mohandas Gandhi (1986). Currently, Union Square serves as a recreational park, subway station, and hosts seasonal markets. Union Square Park and the surrounding area suffered from the economic decline during the Great Depression as commercial businesses began to move uptown due to cheaper real estate. Furthermore, the fiscal crisis that hit New York City in the 1970s caused a physical dereliction of the Union Square area, further attracting drug dealers and prostitutes. As the City began to find ways to revitalize the area, several zoning measures were passed to permit the construction of high-rise buildings. In turn, the fates of several historic structures were under threat of demolition. The changing urban landscape of Union Square Park and the surrounding area promulgated preservationists living in the area to seek the designation of a historic district to protect the area from towering high-rises. The battle to designate a Union Square Historic District began in the 1980s. The Union Square Community Coalition (USCC) was formed in the Spring of 1980 as an advocacy group seeking to bring back Union Square Park from urban decline.17 Jack Taylor, a member of the Coalition and the president of The Drive to Protect the Ladies' Mile District, joined the USCC and advocated for the preservation of the area. Evelyn Strouse was another preservationist who belonged to both The Drive to Protect the Ladies' Mile District and the USCC, and urged for the preservation of the Union Square neighborhood.18 The Coalition felt the best method to protect the area was by designating buildings as New York City Landmarks. They petitioned the New York City Landmarks Preservation Commission to designate a Union Square Historic District. The Commission turned them down citing that too many open gaps, parking lots, and new buildings destroyed the unity and "sense of place" in Union Square.19 The Coalition, still eager to save vestiges of the neighborhood, embarked on designating individual landmarks. One of the first buildings that the USCC tried to designate a landmark was Lüchow's Restaurant. The restaurant was built in 1882; construction began on the same day of the first Labor Day parade in Union Square Park.20 Lüchow's was an important meeting spot for German Americans and was also frequented by the workers from Steinway Hall and the Academy of Music. In 1982, the owners sold the building and relocated uptown. The building sat vacant and faced deterioration due to neglect. Since new zoning amendments allowed for high-rise construction on 14th Street, developers saw Lüchow's as a soft site because it was not built to its full capacity. Jeffery Glick, luxury apartment developer, had bought the property in order to build a high-rise condominium.21 In an effort to save the restaurant, preservationists petitioned the New York City Landmarks Preservation Commission to designate the restaurant as an individual landmark. They garnered public support by enlisting celebrities such as Woody Allen and Joseph Papp.22 The Municipal Art Society also supported the designation of Luchow's Restaurant. However, the commission turned down the designation proposal. Lüchow's was razed because of a fire in the early 1990s.23 The site is now the home of New York University dormitories. There was also a successful effort to preserve Ladies' Mile near Union Square as an historic district. The Ladies' Mile Historic District lies just north of the Union Square Park area. Similar to Union Square, the Ladies' Mile district was a center for commerce and entertainment in the mid-1800s. USCC joined the league of advocacy groups, which included The Drive to Protect the Ladies' Mile District, in order to petition the New York City Landmarks Preservation Commission for designating the district. Jack Taylor along with Evelyn Strouse spearheaded this campaign, and advocated for the district boundaries to extend south of 14th Street to 9th Street in order to include Union Square.24 The commission turned down the proposed district boundaries. Eventually, they reached an agreement for the district boundaries north of 14th Street when the Ladies' Mile Historic District was designated in 1989. There are still many ongoing pursuits for landmarking in Union Square. Despite the individual victories for landmarking buildings in Union Square, USCC has several other buildings on the agenda for designation. One ongoing "crusade" that Jack Taylor relentlessly pursued was the designation of the former Tammany Hall, which is now the New York Film Academy.29 The building was constructed in 1929 in a neo-Federal style to replicate the original Federal Hall on Wall Street. The controversial nature that Tammany Hall represented contributes to the political history of New York City.30 The hall has also contributed to labor history when it was reused by the Ladies' Garment Workers Union in the 1940s.31 The USCC petitioned the New York City Landmarks Preservation Commission for its designation along with three other historic buildings in the Union Square area. Tammany Hall was finally designated in 2013. The North Plaza of Union Square is another area of potential future preservation and revitalization. The North Plaza of Union Square Park was the key location for political demonstrations, festivities, and parades.32 The Union Square Partnership Business Improvement District recently proposed extensive plans that would alter the area of the North Plaza, which included a new 15,000 square foot playground, the planting of 50 new trees, and the heavily disputed year-round restaurant in the "classically designed pavilion. "33 The USCC filed a lawsuit against the City to prevent these extensive plans. The court case was heard at the State Supreme Court level but ruled in favor of the City, citing the restaurant was "consistent with public purpose. "34 The redesign of the North Plaza also includes a new playground facility that Evelyn Strouse, a former member of Community Board 5, strongly advocated for.35 The playground has been named in her memory. “Union Square Park: Union Square,” NYC Parks 26 February 2016. Union Square Savings Bank, New York City Landmark Designation Report, 19 February 1996. Steinway Hall, New York City Landmark Designation Report, 13 November 2001. Timothy C. Coogan, “Union Square: A Memorable Place for Radicals,” American Historical Association (January 2-5, 2009). Everett Building, New York City Landmark Designation Report, 6 September 1988. Germania Life Insurance Company Building, New York City Landmark Designation Report, 6 September 1988. Karen Mathiasen, Interview with Jack Taylor at the New York Preservation Archive Project, 13 October 2007. “Union Square Community Coalition History,” Union Square Community Coalition 26 February 2016. Albert Amateau, “Evelyn Strouse, 92, fiesty doyenne of Union Square,” Villager, Vol. 78, No. 36. 4-10 February 2009. Philip S. Gutis, “About Real Estate; Union Square Area Getting a New Look,” The New York Times, 10 January 1986. Monte Williams, “Neighborhood Report: Union Square; End Is Near for the Old Luchow’s,” The New York Times, 25 December 1994. Sewell Chan, “Pei’s University Village Tops List of 7 Landmarks,” The New York Times, 18 November 2008. Albert Amateau, “L.P.C. electrified by Con Ed ‘commanding presence,’'” Villager, Vol. 78, No. 37. 18-24 February 2009. “Tammany Hall Building: North East corner of Union Square,” Union Square Community Coalition 26 February 2016. C. J. Hughes, “People Converge, & Interests Compete,” The New York Times, 26 December 2008. John Del Signore, “Union Square Pavilion Restaurant Gets Green Light From Judge,” The New York Times, 31 March 2009. Albert Amateau, “Unity on renaming Union Square Park playground for Evelyn Strouse,” Villager, Vol. 78, No. 44. 8-14 April 2009.